Don’t take pain and injury lying down! When you’re injured and in pain you want clinical management of your issue to begin as soon as possible – that’s exactly what Bayside Standing MRI provides. 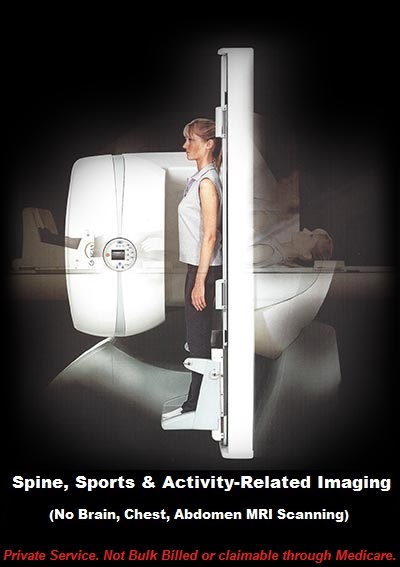 Bayside Standing MRI has the only standing magnetic resonance imaging or MRI machine in Victoria. Unlike traditional MRIs, which have the patient lying down, the standing MRI can scan particular regions of your body in a variety of positions – including standing up. In this weight bearing position we can better assess a range of issues and injuries. In fact, in some cases, we can detect issues that won’t be detected in a lying down position. As well as improved scanning, Bayside Standing MRI aim to provide you with the fastest possible assessment of your injury. Your General Practitioner, specialist or other registered health care practitioner can refer you directly to us or you can come to our centre without a referral. This can shave weeks off your assessment time, which means you’ll be able to have your injury – and the associated pain – attended to quickly. If you don’t have a referral, don’t worry. We can look after you at Bayside Standing MRI. Bayside Standing MRI is open for urgent cases, 24 hours a day, 7 days a week. Phone 0417 160 912 for after hours service. Using Bayside Standing MRI will typically cost no more out of pocket than a standard MRI. Go to our medical expenses page for further information. Unlike traditional MRIs, Bayside Standing MRI’s machine is not enclosed and is therefore often more comfortable for people with claustrophobia.